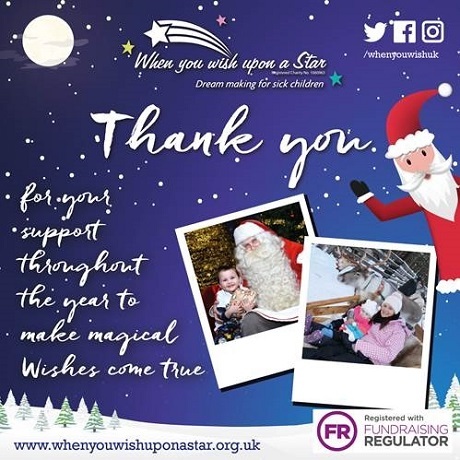 The Häfele UK team have worked relentlessly throughout 2017 to raise funds for this years charity partner, When You Wish Upon A Star. This deserving charity grants the wishes of children living with life- threatening illnesses. We are thrilled to announce that so far this year, we have donated a total of £10,800 to the charity and are well on our way to increasing this to £20,000 by the end of the year. From our fundraising, we were able to send 22 childrenwith elife-threatening illnesses to speand a magical day with Father Christmas in Lapland. The money has been raised over the course of the year, with employees at every level taking part in a variety of fundraising activities, including quizzes, sporting events and cake sales. Our recent Laps for Lapland event, which involved walking or running around Draycote Water, raised an incredible £2,500. We have also donated over £2,000 collectively to 28 additional charities over the course of the year. To find out more about Häfele’s charity fundraising, visit our JustGiving page.